Hateplow, featuring key members of Malevolent Creation and Cannibal Corpse, is a critical supergroup to the extreme metal world. Originally formed merely as a one-time special project, Hateplow has had a lot of staying power in the underground. Hateplow managed to follow-up their one-off disc "Everybody Dies" with another full-length titled "The Only Law Is Survival." And nearly a half-decade later a live recording makes its appearance for the metal masses to devour. 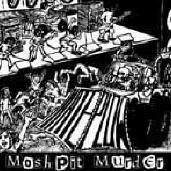 "Mosh Pit Murder" features ten live tracks recorded on the 2000 tour supporting "The Only Law Is Survival," Hateplow's original and until now unreleased 1996 demo, and one demo track from 1999. Recorded at a single concert, the disc's nine live tracks (ten songs total) are appropriately raw yet full of energy. Hateplow's material is undoubtedly death metal in origin, but is fully steeped in punk-like energy and non-death metal lyrical topics. Additionally, it sounds like much of the between song banter has been left intact which gives the overall impact of the live recording a full burst of honesty. The demo tracks have that under-produced quality that most demos have (rightfully so). These tracks have more of the traditional death metal intensity and fierce growl that the genre needs to be effective more times than not. In all reality, fans of Hateplow, Malevolent Creation, and Cannibal Corpse will want the disc for the demos probably more than the live tracks. Personally, I was happy about the live tracks and wouldn't have been the least bit bothered if the album was only the live tracks. Last, but not least, Hateplow fans will want the demos for the sheer fact that original bassist Tim Scott and drummer "Crazy" Larry Hawke provide the blistering rhythm section that Hateplow was originated under. The bottom-line is that "Most Pit Murder" is probably for fans of Hateplow, Malevolent Creation, and Cannibal Corpse. As such "Most Pit Murder" will probably have limited appeal, but for those of you to which it appeals will have a grand ol' time listening to it. "Mosh Pit Murder" was produced by Hateplow. The sound quality is just about average, but sometimes that's best as polishing it too much could have lost some of the energy and power that Hateplow put forth in the live setting. Hateplow: Kyle Symons on vocals, Phil Fasciana and Rob Barrett on guitars, Doug Humlak on bass, and Dave Culross on drums. (Tim Scot played bass and "Crazy" Larry Hawke played drums on the demo tracks). For more information visit http://hateplow.cjb.net/.